Dishes have provenance and memory. The most mouth-watering and delicious ones evoke family, context and relationships. The recipe was initially told to me by my sister, María, when both of us were in our twenties. It was a delight to have entered the grown-up world and cook a recipe that included beer. There was a bit of transgression in the idea of “borrachos”/ “Drunk. Served piping hot in a small bowl, this dish is just plain delicious. It also serves as key memory of Chicano experience. My non-Chicano friends tell me that they’ve made these for office parties and also for home dinner parties and the “borrachos” are a hit. Oh, if you omit the beer, you have “Frijoles Charros” which are also delicious. No transgression. 1. Pick through the beans to remove any little rocks or debris, rinse them, and then place them in a large pot and cover them with water rising 2 inches above the beans. Add the beer, bacon, and salt and bring to a boil. Turn down the heat to a slow simmer and cook for about 2–4 hours until they are completely soft. Add more water during the cooking as needed so that they do not dry out. I place them in a crockpot, medium or high setting, and cook for 6–8 hours. 2. 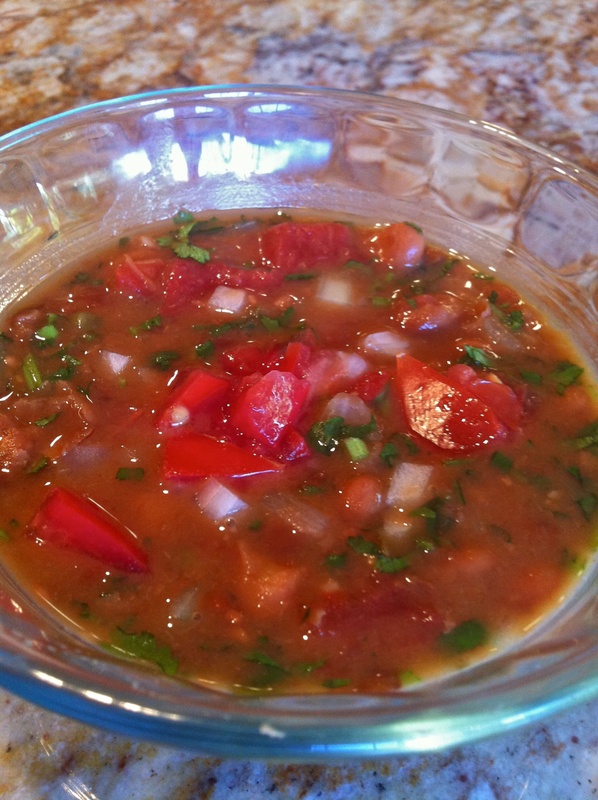 When the beans are cooked, add the onion, tomato, and the chile and cook for 20 minutes. Just before serving, add the bunch of coarsely chopped cilantro. As I mentioned above, my sister, Esther, who taught me this recipe, cautions anyone who makes this recipe to avoid overcooking the onion and tomato. Serve in small bowls and just watch the smiles on everyone’s faces. The” pick through to remove little rocks and debris” was a ritual in our home… for the girls to do. At the kitchen counter at the edge of the stove , the wooden cutting board, the dented colander ( I have one just like it today 50 years later!) The molcajete, sakt, pepper and oil and spices right at the top of the cutting board… I loved running the beans beneath the gushing water from the faucet and swilling them around through my fingers to get them rinsed. But only mama was the one to put them on… check them, add water then decide when they were done… all of this belongs to the “philosophy” of frijol pinto! At least, in my opinion… Thank you for this information about the philosophy of foods on your page on the pinto bean ! And I will certainly make this recipe for the frijoles charros. All of us here on New Years Night were taken in with a flavor that made for some great “Yummmm!” sounds coming out of people as they ate! I Thank You for this recipe.. one which we will always use and especially on some fishing trips where we need that just right taste! Adán, this sound wonderful -esp. the frijoles borrachos version (since everything is better with beer). I will definitely be trying them!